Is Cancer woman Leo man compatible mentally, emotionally and sexually? Are Cancer woman and Leo man a good match? Sometimes a water sign like the Cancer woman has trouble mixing with a fire sign like the Leo man. She is fluid in her thoughts and emotions, but he is more steadfast. But these two opposite zodiac signs an be complementary and learn a lot from each other once together in a relationship. A female crab is a complex person, deep and intuitive yet emotional and unstable. This can be difficult for the male lion to comprehend, as he is durable and unwavering. But he can also serve as a solid foundation for her to land on when she’s feeling insecure, and he will protect her to the end in this Leo compatibility. This will be the main attraction for the dating Cancer woman, as she needs nurturing and support from her partner. And he will offer that to her in spades. The Leo man is fiercely devoted to his friends and family, and he will extend that to his lover as well. The Cancer female in love also appreciates his honesty and integrity, and he admires her strong yet nimble mind. She pampers him with love and affection, as she knows it is necessary to stroke his ego keep him interested. And the Leo male returns the favor in his typical generous fashion. This kind of give and take works wonders in the bedroom. The Cancer female sexually is sensual and caring, drawing him in with her slow, alluring foreplay. Then he unleashes his passion, bringing her to a new level of ecstasy. He is the king, and the Leo man sexually raises her up to be his queen, making her feel like the only woman in the world. Her feminine energy satisfies his masculine prowess, and they become one easily and naturally. This helps to strengthen the Cancer woman and Leo man bond, cementing their romantic and practical relationship. Read about dating a Leo man. 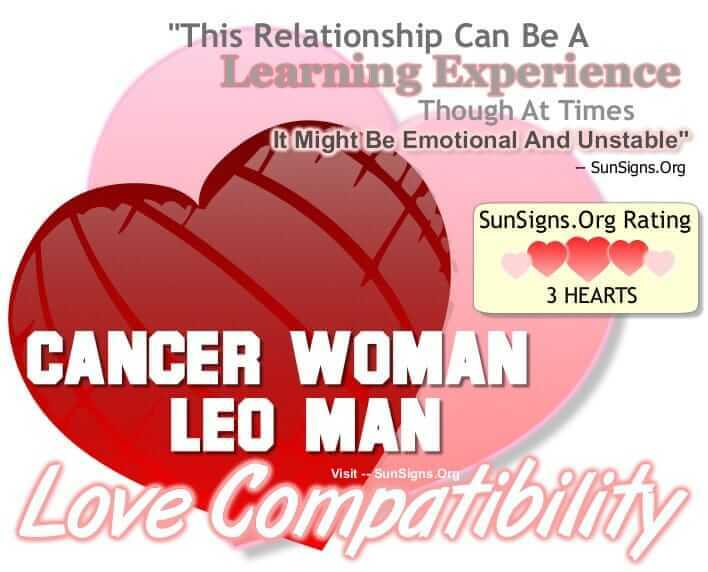 The only thing that can jeopardize the Cancer woman Leo man love compatibility is the Leo man’s need to be in charge. He automatically takes the reins, being a born leader, leaving the Cancer woman feeling lost or out of control. She needs to be an equal partner, not a submissive damsel in distress. If he can relinquish some of the control to her, the Cancer woman Leo man match will be a gratifying union indeed. But when the two sun signs return to reality, sparks of a different nature may fly. The Cancer woman is shy and more reserved than her active Leo man in love, who is always the center of attention. She may feel left out if he goes off on his own to be with his adoring public. And he sees her as overreacting, which will make him seem distant and aloof. If she has one of her emotional outbursts, he will grow angry and frustrated with her, wanting to get away from the drama. She, in turn, will retreat into her shell to skulk over his lack of compassion. There will be a constant struggle between the Cancer woman and Leo man. They both will just not be ready to listen to each other. Leo men need to be out and about while the Cancer women would rather stay in for the night, enjoying their cozy home. This is where he feels she is putting a damper on their relationship, while she believes he’s too selfish or egotistical about this Cancer compatibility. Cancer is a cardinal water sign whereas Leo is a fixed fire sign, the Cancer woman Leo man compatibility gets a THREE Hearts rating. If the Leo man can tone down his domineering nature, and the Cancer woman can come out of her shell to share the spotlight with him, they can only grow as a couple. And since both star signs are loyal companions, they will remain with each other until the end of time. They just need to find the right balance in this zodiac match. Hi my name is Melissa I am a Cancer and my love is a Leo, we have been together four years. Our relationship isn’t perfect but We have a love that I know for a fact most people will never experience in this lifetime. We are inseparable and do everything together. He spoils me to death, is such a hard worker, and very loyal. I love my Lion 🦁 he is my King and I am his queen! Just listen to your Lion or Lioness when they tell you how they feel. Because they don’t open up very often. Get to know them and don’t judge them to quickly. My Lion is the greatest man I have ever known. I’m lucky to have him in my life. Cancer women have the scary ability of shutting off their emotions like a lightswitch which unnerves Leo. Sexually an awesome union — she’s incredibly feminine — but I’m not sure they’d get past their emotional differences to make it worth the longterm. Cancer is an oddball that way.